Shopping for a new Ford Fusion? The 2019 Ford Fusion Hybrid delivers good fuel economy, but a Fusion SE is a good deal for about $25,000. The 2019 Ford Fusion’s good looks get shoppers in the door, but this sedan is starting to show its age. The 2019 Ford Fusion has a pretty face, even if it’s not the freshest mid-size sedan around. We named it our Best Car to Buy 2013, and in that time it has watched Michael Phelps retire twice, LeBron James go back to (and away from) Cleveland, and the Chicago Cubs win the World Series. It’s a veteran. This year, the Fusion’s styling is modestly tweaked and all models gain standard automatic emergency braking and blind-spot monitors. The Fusion lineup has also been pared to S, SE, SEL, Titanium, and Sport trim levels. 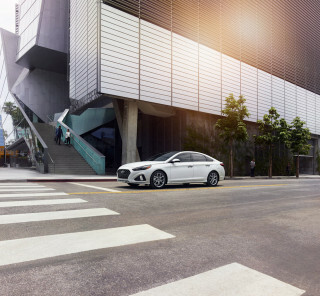 The Fusion Hybrid can be ordered in SE and SEL trim, while the plug-in hybrid Fusion Energi comes in Titanium trim only and now has a 25-mile electric range. We might like the Fusion, but we’re not so sure that Ford does anymore. The automaker is phasing out sedans and hatchbacks in favor of an all crossover, SUV, and pickup lineup. The Fusion is likely the last to get the boot, but that may come as soon as after the 2020 model year. Base Fusions use a 2.5-liter inline-4, while turbo-4s in 1.5- and 2.0-liter sizes are optional and highly recommended. The Fusion Sport’s 325-hp turbocharged V-6 makes it a hoot, but at $41,000 it’s priced against some compelling luxury cars. Most Fusions are front-wheel drive, but higher power models send power to all four wheels. The Fusion Hybrid averages upward of 40 mpg regardless of how it’s driven, according to the EPA. Hybrids feature a 2.0-liter inline-4 engine, paired to a two-motor system with a continuously variable automatic transmission (CVT). A larger lithium-ion battery allows the Fusion Energi to travel around 25 miles on electricity only. The Fusion’s interior was revamped a couple of years ago. Most Fusions now have a terrific 8.0-inch touchscreen for infotainment with Apple CarPlay and Android Auto compatibility as well as a built-in Waze app. The Fusion’s rear seat lags some rivals, especially in head room. This year’s major safety upgrade is welcome and it bolsters the Fusion’s solid federal and independent crash test results. The 2019 Ford Fusion’s Aston Martin-lite face is aging well. Some stars age well. Case in point: The 2019 Ford Fusion, which is just as eye-catching today as it was when it bowed in 2012. A couple of minor updates this year neither add to nor detract from the Fusion’s looks. Up front, the Aston Martin-esque wide grille with its horizontal chrome bars sticks around. Below, new strakes in the front fascia house fog lights on higher-trim Fusions but are cheap-looking blanks on S and SEs. The Fusion’s elongated roofline slopes gently into the pert trunk lid. The Fusion goes gentle with its use of chrome this year. SE and higher non-hybrid Fusions have exposed exhaust pipes that enhance the sporty look. Inside, the Fusion gets new upholstery colors this year. Fusion S sedans have a dinky 4.2-inch screen surrounded by hard buttons, but an 8.0-inch touchscreen is optional on the base model and standard elsewhere. Matte silver trim sets off the dash, but the mix of organic shapes looks dated against some sharper rivals. The 2019 Ford Fusion rides well and most models accelerate with authority. 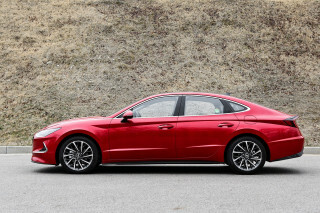 There’s a lot to digest with the 2019 Ford Fusion lineup, but even the most humble models have a ride quality that’s above average for a mid-size sedan. The Fusion S is the cheapest and least powerful Fusion, with a 2.5-liter inline-4 rated at 175 horsepower. Its power peaks high—at about 4,500 rpm—meaning it needs to be revved for good acceleration. The base engine works well enough with the 6-speed automatic transmission, which is shifted via a knob in the center console. It’s an adequate setup overall, but one best left to the rental counter. We’d start with the 181-hp, 1.5-liter turbo-4 in SE and SEL trims. It’s tuned for better torque at the low end and delivers good acceleration from a stop and decent passing power. The 245-hp 2.0-liter turbo-4 in the Fusion Titanium is a worthwhile upgrade for those who regularly have a carload of passengers or live in hilly places. At the top of the Fusion lineup, the Fusion Sport uses a 2.7-liter V-6 rated at a hefty 325 hp and 380 pound-feet of torque. Its acceleration is properly brisk, but this V-6 puts a lot of weight over the Fusion’s front wheels. The Fusion Sport’s engine comes into its own at highway speeds, where mid-range passing is its forte. With all three turbo engines, the 6-speed automatic does a good job putting power to the ground. The 1.5-liter engine is front-wheel drive only, while all-wheel drive is optional with the 2.0-liter and mandatory with the V-6. Regardless of what’s underhood, the Fusion has good, accurate steering a cut above the mid-size norm. It may be light on road feel, but the Fusion’s steering is accurate, direct on the highway, and well-weighted in any situation. Its ride quality is hushed and plush, even with the bigger wheels and stiffer tuning on higher-power versions. Fusion Sports have adaptive dampers that quell the shorter sidewalls on its 19-inch wheels. The Fusion Sport lives up to its name when it comes to acceleration, but the lighter 4-cylinder versions dig into corners better and can be more fun to whip along a curvy road. 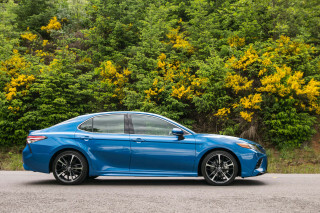 There’s no sport package for 4-cylinder Fusions and that’s just fine with us. These sedans ride and handle well enough in any configuration. The Ford Fusion Hybrid and Energi don’t stand out much at first glance. Pop their hoods and you’ll find a 2.0-liter Atkinson cycle inline-4 paired to an electric motor good for a combined output of 188 horsepower. A continuously variable automatic transmission (CVT) shuttles power to the front wheels. Tucked into Fusion Hybrid and Energi sedans’ trunks is a lithium-ion battery pack—1.4-kwh in the Hybrid and 9.0-kwh in the Energi. This year’s Fusion Energi boasts a larger capacity battery that Ford says delivers about 25 miles of electric-only range after a charge that takes about seven hours on a household outlet and about half that on a Level 2 charger. 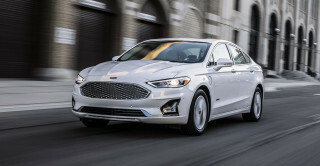 Both hybrid versions of the Fusion share the same good handling and quality ride of the gas-only models, albeit with a slightly heavier feel. Updated engine software a couple of years ago yielded a smoother, more direct feel. Brake blending is a high point on the Fusion hybrids. They combine regenerative and friction braking better than most hybrid systems. The 2019 Ford Fusion handles passengers well up front, but taller riders will find limited rear-seat head room. The Fusion stretches 192 inches and has a 112.2-inch wheelbase, which is enough to almost push it into the EPA’s full-size category. Non-hybrids have a 16-cubic-foot trunk. The lithium-ion battery in the Fusion Hybrid and Fusion Energi digs into cargo space considerably: there’s just 12 cubes in Fusion Hybrid form and a mere 8.2 cubic feet in the Fusion Energi. Front seat passengers have supportive seats with standard lumbar adjustment for the driver on all models. The standard cloth has a tough feel, but the beige and black tones are uninspiring. The Fusion SEL subs in a new synthetic leather material, while the Fusion Titanium and Sport feature real leather. Second-row riders get 38.3 inches for leg room but just 37.8 inches of head room. The low roofline limits ingress and egress for taller passengers, too. Base Fusions have some high-sheen surfaces and hard plastics that are replaced with nicer trim on ritzier models. The 2019 Ford Fusion has a solid crash-test record bolstered by newly standard active safety tech. There’s some room for improvement, but the 2019 Fusion performed well in both IIHS and NHTSA testing. The insurance industry-funded group calls it a Top Safety Pick and rated it “Good” in every crash test. Its newly standard automatic emergency braking system earned the top “Superior” rating. Only weak headlight performance—“Poor” according to the IIHS—prevented it from earning Top Safety Pick+. The NHTSA rated the 2019 Fusion at five stars overall, although the feds noted a four-star frontal crash and a four-star rollover risk. The Fusion Energi has not been crash tested, but it doesn’t differ much from other models. This year, Ford made automatic emergency braking with pedestrian detection, active lane control, automatic high-beam headlights, and blind-spot monitors standard fare on every Fusion. Adaptive cruise control is optional on some trims, where it’s bundled with navigation. 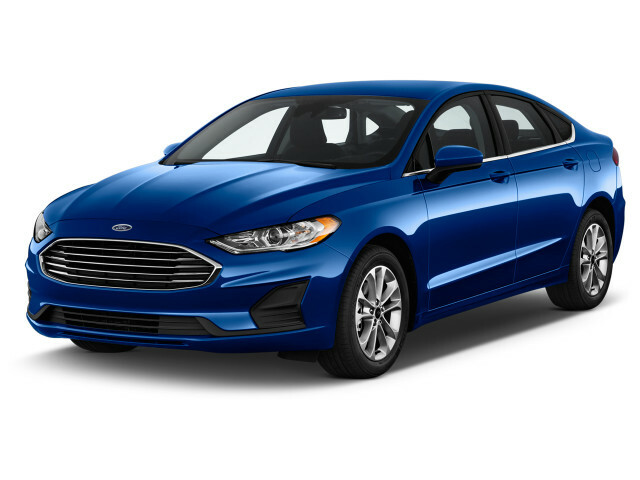 A weak base 2019 Ford Fusion is offset by solid features in other trims. The base Fusion S is a rental special with its underwhelming engine, steel wheels with hubcaps, 4.2-inch screen, and limited options. For about $1,300, a package adds adaptive cruise control, an 8.0-inch touchscreen for infotainment with excellent software, baked-in navigation, Apple CarPlay and Android Auto compatibility, and dual-zone automatic climate control. But for that money, you might as well step up to the Fusion SE at about $25,000. It builds on the base S with a turbo-4 engine, power-adjustable front seats, automatic climate control, 17-inch wheels, the larger infotainment system, parking sensors, and a few other items. We’d pay another $650 for adaptive cruise control bundled with navigation, and we’d wind up with a nice sedan for about $25,700. The Fusion SEL costs nearly $30,000. Its heated front seats, synthetic leather upholstery, 18-inch wheels, memory driver’s seat, 11-speaker audio system, and garage door opener are nice—but not necessary. Instead, the Fusion Titanium for about $35,000 seems like a smarter way to splurge with its leather upholstery, Sony audio system, 2.0-liter turbo-4, all-wheel drive, power moonroof, and navigation. Ford builds everything into the Fusion Titanium—just pick your color. On the Fusion SE and SEL, all-wheel drive and the 2.0-liter turbo-4 add about $2,800 to the price. The Fusion Sport stands on its own at about $41,000 with heated and cooled front seats, a turbocharged V-6, all-wheel drive, and 19-inch wheels. The Fusion Hybrid is available in SE, SEL, and Titanium trims. They add adaptive cruise control and navigation but otherwise mostly mirror their gas-only counterparts for about $2,500 more. The Fusion Energi comes only as a Titanium and costs about the same as the Hybrid Titanium once federal tax credits are applied for eligible buyers. The 2019 Ford Fusion makes for a thrifty hybrid, but other models are less green. 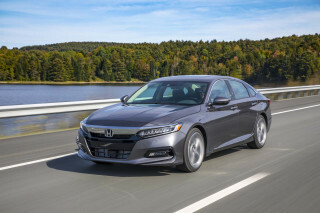 Our baseline rating is for Fusions with the 1.5-liter turbo-4, which trails class leaders such as the Honda Accord. Still, it’s better than the base Fusion. With the standard 2.5-liter inline-4, the Fusion S is rated at an unimpressive 21/31/25 mpg. 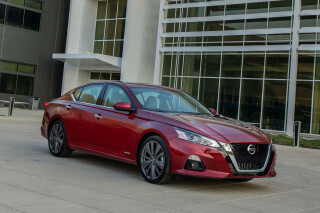 The 2.0-liter turbo-4 with all-wheel drive is rated at 20/29/23 mpg, while the zippy Fusion Sport’s V-6 drops those figures to just 17/26/20 mpg. Now for some good news: The Fusion Hybrid is rated at 43/41/42 mpg, making it a thrifty choice no matter how it’s driven. A larger capacity lithium-ion battery for this year’s Fusion Energi plug-in hybrid means it can drive 25 miles on electric power alone on a full charge. It's rated at 103 MPGe, or 42 mpg combined.